These were some of the opening statements made by students who competed in the first ever Multicultural Speech Competition at CedarBridge Academy. The Multicultural Speech Competition is just one aspect of the monthly Multicultural events held at CedarBridge Academy during May. The students and teachers come to school in multicultural dress from other countries. Students learn about the cultures that exist in the school and are asked to ensure they understand that culture is not just a dress, but a way of life — it can be religion, a type of dress, a way of living, beliefs that are beyond the mainstream. 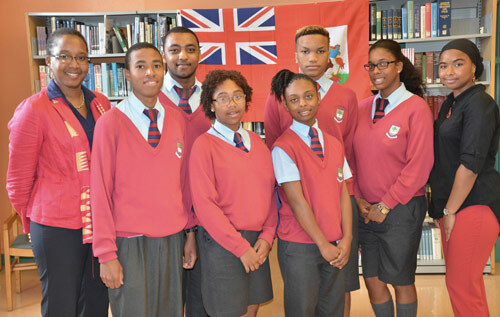 “I was delighted with the participation of these students,” said Judith Gill, Instructional Leader of the Social Studies Department and a member of the Multicultural Committee. A mentor worked with each student to help them work on the delivery of their speech and they had to research the topic and write their speech. The winner will be announced on Friday, during Multicultural Day, when students and staff are invited to participate in several school events designed to reflect the multiculturalism that exists at CedarBridge Academy. Students were judged by outside judges, students and members of the CedarBridge Academy staff. Head judge was Lovitta Foggo, Shadow Minister of Education. Another judge, Linda Franks, said: “I was impressed with the young people who served as judges. They did not present in the competition, but what they did was impressive. “They were able to discern what the issues and strengths were with the speakers and they were able to give valid comments on each. The speech competition was designed to encourage novice and experienced speakers to speak in a competitive fashion.